Our 2019 Fall Conference will be hosted by Palmer High School, November 1 – 3, 2019. Watch this space for more information! 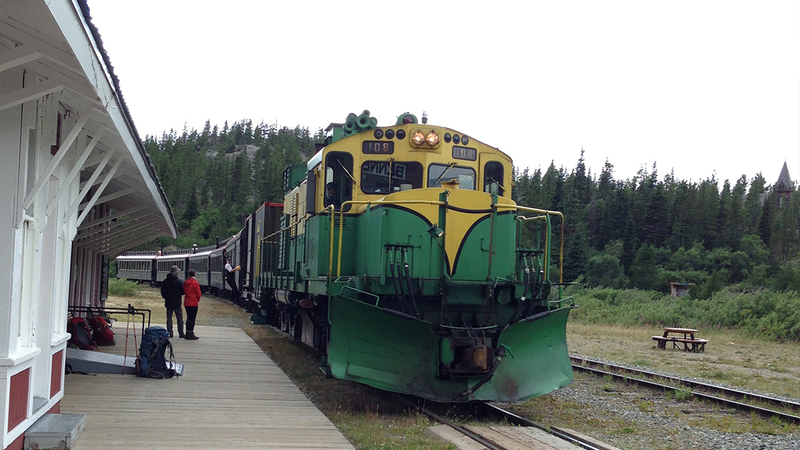 Visiting students had the opportunity to ride the White Pass and Yukon Railway and hear the story of Soapy Smith. Brandon Love from the Beanstalk Project was the keynote speaker on Saturday. 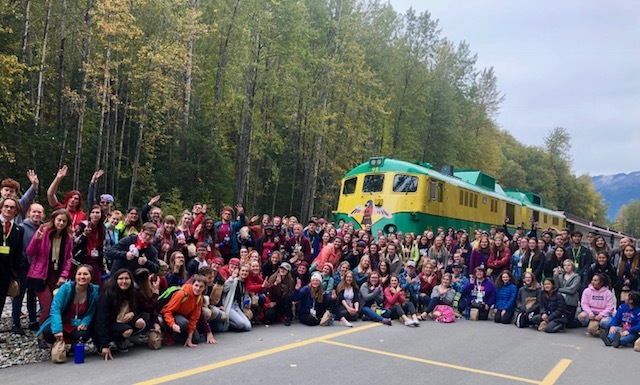 Students were also entertained by the Whitehorse Dakhká Khwaán Dancers, along with a city tour of Skagway and the Days of ‘98 Show. Another of the highlights from the three-day conference was the election of new region representatives for the association executive board. 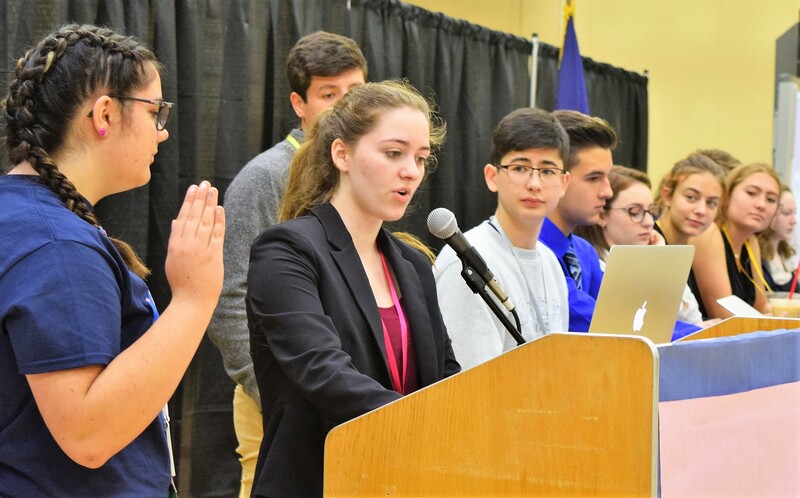 New reps include Ethan Sundown, Bethel Regional High School – Region I Representative; Jacob Cook, Tri-Valley High School – re-elected to represent Region II; Ashlee Shaeffer, Valdez High School – Region III Representative; Hendrikje Bodine, Eagle River High School – will represent Region IV; Dylan Chapell, Haines High School – Region V Representative and Eleanor Adasiak, Lathrop High School – Region VI Representative. Each will serve a one-year term on the board. 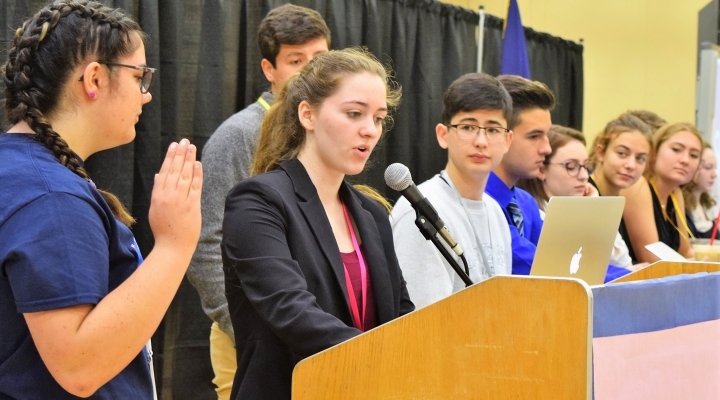 Abigail Jensen, Wasilla High School, was elected as the AASG Representative to ASAA and will serve a two-year term. One of the major functions of AASG conferences is for the general assembly to hear and vote on proposed resolutions. 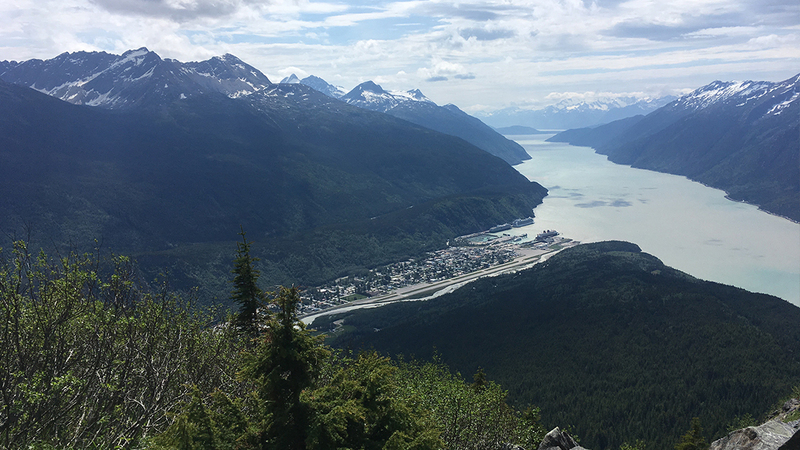 Following often lively debate, a number of resolutions were passed at the Skagway conference on topics ranging from local issues, to statewide issues such as Alaska’s Proposition One on the November ballet. Passed resolutions are then forwarded to the appropriate school or governing body for consideration. Once done, these resolutions will be posted on the AASG website. The Spring AASG conference was also announced. The spring 2019 conference will be hosted by Bethel Regional High School, April 11-13, 2019. 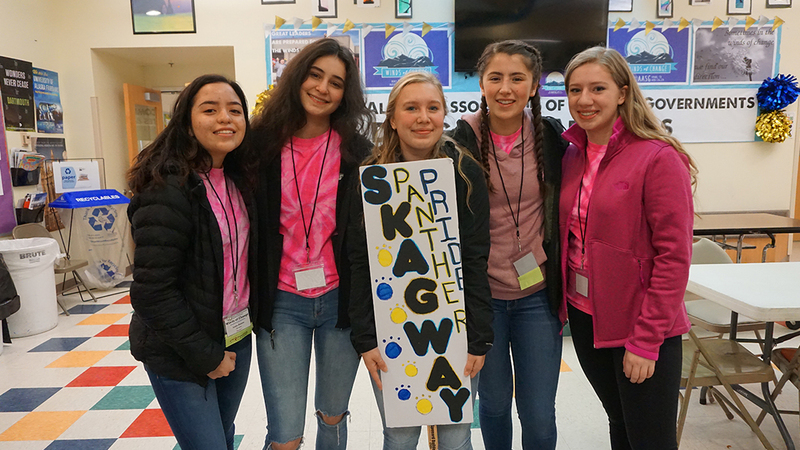 Our thanks again to everyone at Skagway High School and the community of Skagway for their warm hospitality and for making this conference such a success! Conferences are an exciting opportunity for both the students that attend and the schools that host them. 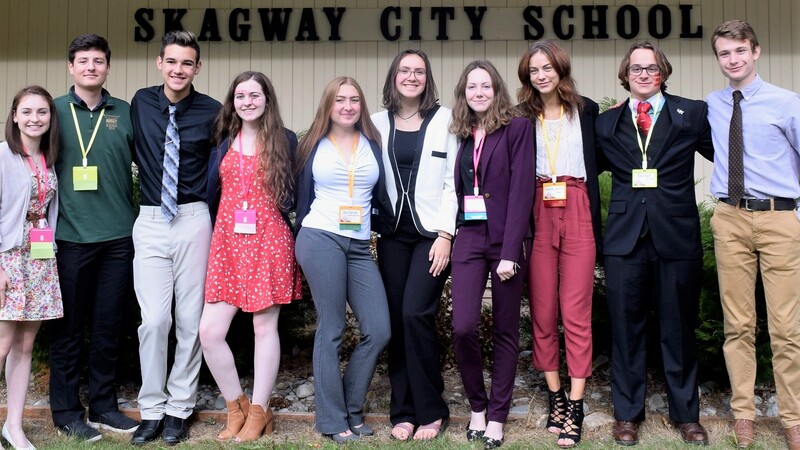 Past conference hosts Anthony Jensen (Wasilla High), Danielle Lewis (Eagle River High), Elizabeth Bender and Lindsey Glenn (Kodiak High), Barbara Petukh Jackson (Mat-Su Career Tech), and Mara Sheakley-Early (Thunder Mountain High) are available to lend support and guidance in your decision to become a conference host school. Host schools will also have the support of the AASG executive board. 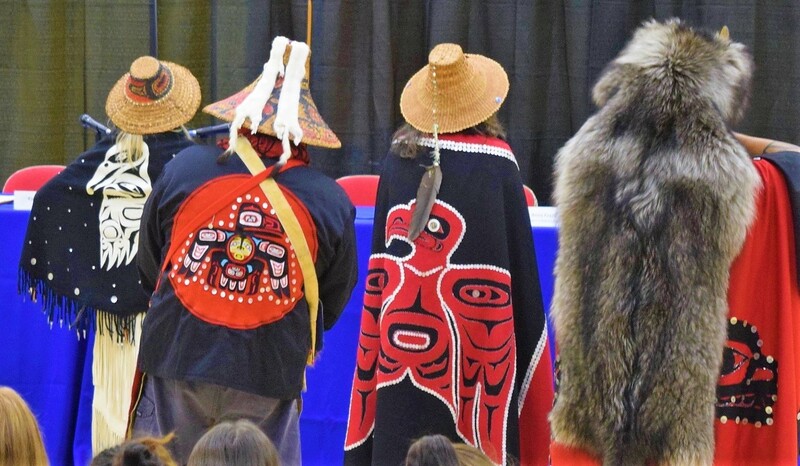 Our parent organization, the Alaska School Activities Association, has also agreed to forward-fund a portion of your conference, which will help with many of the up-front costs of the conference. 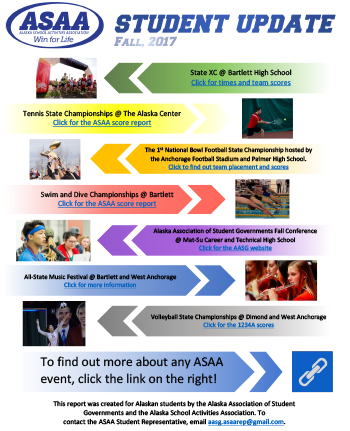 Please go to the Hosting a Conference page for more information and the application form to host an AASG statewide conference.